​ Online registration ends November 3rd at midnight. On-site registration will be available during the clinic. What is the Great Lakes Coaches' Clinic? The goal of the clinic is to help Science Olympiad coaches learn how to prepare their teams for this year's competitions. Who should attend the Great Lakes Coaches' Clinic? The GLCC is meant for coaches of every level, and we invite coaches from across the country to attend. We are placing an emphasis on supporting new coaches this year. High school students and younger children are not allowed into the clinic. Who are the presenters at the Great Lakes Coaches' Clinic? We have National Rules Committee Chairs, National Event Supervisors, State Event Supervisors, Regional Event Supervisors and veteran coaches as presenters. See the Presenters section below for a current list of confirmed presenters. What types of sessions are offered at Great Lakes Coaches' Clinic? Event Sessions: These sessions deal with how to prepare your team in a particular event. We offer sessions in every event in both Division B and Division C.
Build Sessions: These sessions are presenter-guided hands-on building experiences in a particular event. Materials are provided. More information about how to sign up for these sessions is below. Coaching Sessions: We have sessions with tips for new coaches, coaches looking to advance their programs, and, (new this year!) how to write and supervise a Science Olympiad event at a competition. ​How many sessions can I see? There are 3 sessions on Friday evening and 7 sessions on Saturday. It isn't possible for one coach to attend the sessions for all 23 events in your division. We highly recommend bringing more than one coach and splitting up to see as many sessions as possible. Please note: Build Sessions span multiple sessions during the clinic. You will be able to attend fewer other sessions if you participate in a Build Session. Yes! We will provide dinner on Friday, as well as breakfast and lunch on Saturday. Treats, snacks, and beverages are available throughout the clinic. Please note: Great Lakes Coaches' Clinic offers meat and vegetarian food options only. We cannot offer foods for those with special dietary needs such as gluten free, vegan, etc. Please plan accordingly if you have special dietary needs. What is included in the Great Lakes Coaches' Clinic registration fee? 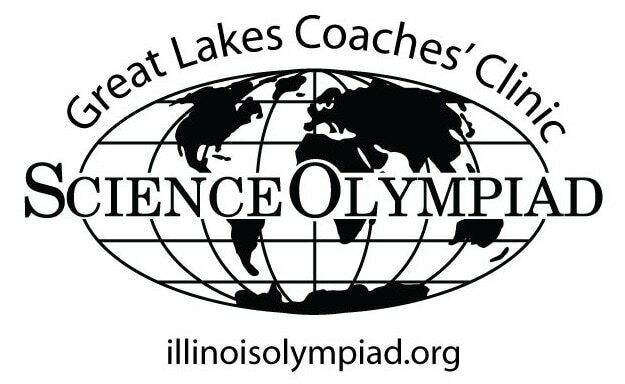 Will there be Science Olympiad-related items for purchase at Great Lakes Coaches' Clinic? We are working on expanding our vendor presence at GLCC. Please watch the vendor space below for more information on which vendors will be at the clinic. If you have a suggestion for a vendor your team finds valuable, please tell us here! ONSITE Registration will be available November 9 & 10. Payment can be by check, money order, or PayPal. (PLEASE NOTE: Credit Card processing may NOT be available the day of the clinic, so please have an alternate form of payment available). On Ezra, create a User Account. Head coaches wishing to send a group, please contact Stacy Martinez (stacy.martinez@illinoisolympiad.org) to get a group code for each individual to use when they register. If you are not the head coach and are registering as part of a group, please contact your head coach for the group code. Group rates are available for groups of 5 or more people. All members of the group MUST use the group code provided by the head coach to receive the discounted rate. **Denotes sign-up session. See more information below regarding these sessions. Signing up for Sessions is on-site on a first-come, first-served basis. Sign-up sheets will be in the Registration area of the clinic. Email/phone requests will not be accepted. Sign-up for the Friday evening Sessions opens at 5:30pm on Friday; Sign-up for the Saturday Sessions opens at 6:45am on Saturday. If there are multiple sessions for a particular event, schools are only allowed to sign up for one session for that event. Schools will only be allowed to sign up for additional Sign-Up Session slots if space is available when session registration closes. Anyone who signs up for a Sign-Up Session will be expected to stay for the duration of the session. We are thrilled to have some of the foremost experts in Science Olympiad presenting at the Great Lakes Coaches' Clinic. Other Worlds Educational Enterprises - Accepting Credit Cards!